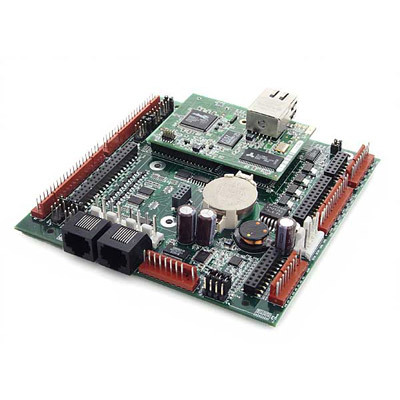 The BL2600 single-board computer provides embedded system engineers a complete and expandable performance package. Two standard models—one with 10/100 Ethernet, one without—feature the Rabbit® 3000 microprocessor at 44.2 and 29.4 MHz respectively, with at least 512K Flash and 512K SRAM (standard). The BL2600 is an advanced single-board computer that incorporates the powerful Rabbit 3000 microprocessor, Flash memory, SRAM, digital I/O ports, A/D converter inputs, D/A converter outputs, RS-232/RS-485 serial ports, and a 10/100Base-T Ethernet port. Optional RabbitNet Expansion and serial Flash cards are available. The BL2600 can be connected via two mechanisms: Dual-entry IDC through-hole sockets, which allow header mounting on either side of the board and polarized locking industry-standard friction-lock connectors that enable rapid assembly with wire harnesses. These connectors provide dependable cable harness connectivity to I/O. RabbitNet expansion boards are available (including A/D, D/A, digital I/O, and keypad/display interface cards) to interface via the two multiplexed SPI RS-422 ports. Digital Inputs 16: Hardware-configurable pull-up or pull-down, ±36 V DC, switching threshold 1.4 V typ. Board Size 4.85" × 4.96" × 1.00"